Advertisers sometimes pay just a few thousand dollars for air time on CNBC. But for Wednesday night's GOP debate the asking price was a cool quarter of a million dollars. That's because the debate is expected to score CNBC's biggest audience ever. About 25 million viewers watched the first GOP debate on Fox News in August and about 24 million watched the second one on CNN in September. CNBC's parent company, NBCUniversal, isn't officially commenting on the ad pricing. But a corporate source says it succeeded in getting $250,000 for some of the 30-second spots it offered to sponsors. The pricing was "north of that" for some of the especially valuable spots, the source said. In other cases, advertisers are likely paying less than $250,000 per spot by buying broader packages of ads. These are negotiations after all. The demand for ads illustrates how the debates have become a hit TV series this fall. The Fox and CNN debates set new viewership records for each cable news channel. Donald Trump received much of the credit for the surge in viewership. But even the Trump-less Democratic primary debate earlier this month, televised by CNN, attracted more than 15 million viewers, far more than any past debate on cable. Trump and his top rival, Ben Carson, are sure to rope in millions of viewers again, this time to CNBC's benefit. But it will be exceedingly difficult for CNBC to match the August and September ratings records. For one thing, the debate is up against game two of the World Series. CNBC also has a much smaller measured audience than Fox or CNN, so a smaller number of viewers may know the debate is happening or how to find it. But NBCUniversal has been extensively promoting the event using its other news properties, including the "Today" show and MSNBC. Rather than televise hours of post-game coverage, like Fox and CNN, CNBC is taking advantage of the larger-than-usual audience to premiere a new episode of its reality show "The Profit." This is what broadcasters do after the Super Bowl each year -- they pick one TV show that they want to introduce to viewers who otherwise wouldn't see it. The idea is that some people will be hooked and will come back to the channel for future episodes. 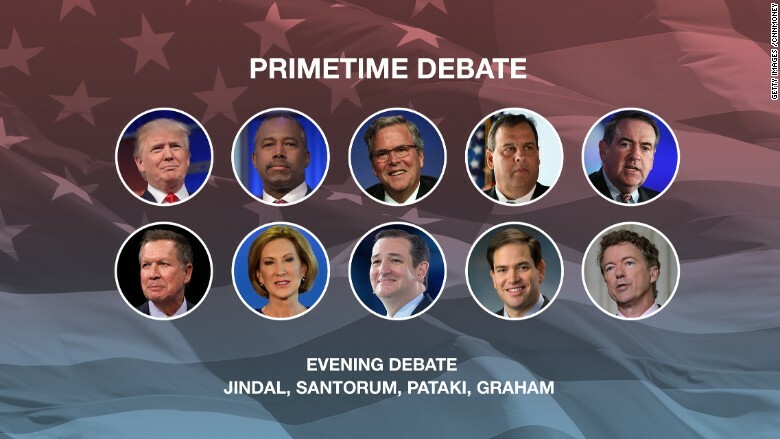 TV ratings for the GOP debate will be available on Thursday. CNBC is not live-streaming the debate for free, so the only way to watch it online is to sign in with a cable subscriber's username and password.